Catch Your Readers - Wylie Communications, Inc. If you want to Catch Your Readers, you need to think like a reader. Then you need to use the bait your reader likes, not the bait you like. 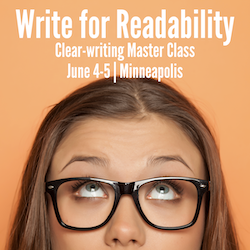 Do a deep dive in 2 days Master a four-part system for Catching Your Readers at our persuasive-writing Master Class on May 1-2 in Denver. Problem is, many of the techniques we’ve institutionalized in business communication writing are not the bait the reader likes. In fact, some of the standards in the corporate communicator’s repertoire are more likely to hinder than help your chances at getting the word out. In this persuasive writing workshop, we’ll debunk destructive writing myths. You’ll leave with scientific, proven-in-the-lab approaches for getting people to pay attention to, understand, remember and act on your messages. PRSA members: Earn 4 APR maintenance credits. It’s counterintuitive, but true: The product is never the topic. The program is never the topic. The plan is never the topic. The topic is never the topic. The reader is always the topic. Move readers to act with a four-step process for giving people what they really want. Take advantage of the formula readers use to determine which messages to pay attention to (and which to toss). Tap two rewards of reading you can use to boost audience interest in your message. Answer the No. 1 question your reader is asking, regardless of your topic, medium or channel. Use a three-letter word that magically makes your message more relevant to your readers. Indeed, our old friend the inverted pyramid hasn’t fared well in recent studies. Studies by the Poynter Institute, Reuters Institute and the American Society of News Editors show that the traditional news structure reduces readership, understanding, sharing, engagement and more. Grab readers’ attention, pull them through the piece and leave a lasting impression. Grab reader attention with a lead that’s concrete, creative and provocative — and avoid making readers’ eyes glaze over by using one of the seven deadly leads. Avoid the “muddle in the middle” by choosing one of five structural techniques from a rubric created by the founder of TED Talks. Draw to a satisfying conclusion in the penultimate paragraph. End with a bang, not a whimper by using our three-step test. Is your copy easy to read? According to communication experts, that’s one of the two key questions people ask to determine whether to read a piece — or toss it. Fortunately, academics have tested and quantified what makes copy easy to read. Unfortunately, that research virtually never makes it out of the ivory tower and into the hands of writers who could actually apply it. Increase clarity by 200%, 300% — even 1,200% or more. Apply a six-step system for making every piece you write clearer and more concise. Use a cool tool (you probably already have it, but you might not know it) to measurably improve your message’s readability. Hit the right targets. How long is too long for your paragraphs? Your sentences? Your words? Increase reading by hitting one key on your keyboard more often. Once you’ve written your headline, David Ogilvy famously said, you’ve spent 80 cents of your advertising dollar. That’s right: Display copy — headlines, captions and callouts, for instance — gets the biggest ROI of everything we write. That’s why I’m often amazed that the same folks who spend hours polishing the analogy in the seventh paragraph of their message toss off a headline in the 17 seconds before happy hour on a Friday afternoon. Most of your readers will never read the seventh paragraph. But many more will read your display copy. People don’t read. So how can you reach them with words? 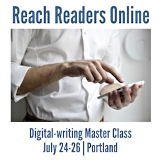 Reach “readers” who spend only two minutes — or even just 10 seconds — with your piece. Avoid dropping the piece of display copy that 95% of people read — but that many communicators forget. Run a simple test on your message to ensure that even folks who will not read your message no matter how well you write it still get your key ideas. Make your copy 47% more usable by adding a few simple elements. Pass the Palm Test to make your message look easier to read. Because if it looks easier to read, more people will read it. In the crunch of writing headlines and meeting deadlines, it sometimes seems as if there’s not enough time to pause and consider how you’re doing. But in our practice sessions, you’ll get a great opportunity for reflection and improvement. Bring your laptop and a story to work on. In this master class, you’ll get a chance to write and rewrite, get and give feedback, and leave with a totally rewritten piece. Write, edit, get feedback — and leave with a totally rewritten piece. Gain valuable insights on your work from your peers and from Ann. Learn to analyze and improve others’ writing — the best skill you can develop for editing others or improving your own work. by March 1, to receive a full refund, minus a 20% handling fee. by April 1, to receive a 75% refund. Sorry, no refunds after April 1. Save $100 if you’re a Rev Up Readership member. (Join Rev Up Readership.) Click “Enter promotional code” and enter your promo code. Yes. Please go to your ticket and update your registration information and dietary information. “Other writing coaches tell you what to do. Ann Wylie runs a training, editing and consulting firm called Wylie Communications. She works with communicators who want to reach more readers and with organizations that want to get the word out. Her workshops take her from Hollywood to Helsinki. There, she helps clients at organizations like NASA, Nike and Nokia polish their skills and find new inspiration for their work. Ann has earned more than 60 awards, including two IABC Gold Quills, for her communications. She is the author of more than a dozen learning tools that help people improve their communication skills, including RevUpReadership.com, a toolbox for writers.